So, yesterday, I posted some animation work and said we needed to do more of it here on Fine Art. Tonight, then: more awesome animation work from people who make video games. Next up is Will Christiansen, who is currently working on Halo 5. 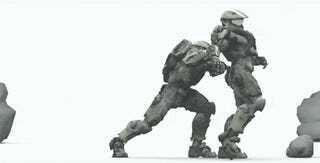 Below is some of the stuff he did for Halo 4. I love these kind of animation vids: strip back everything else from the game and you can really appreciate the little touches they put in. Hope you enjoyed this stuff! And remember, while we tend to focus mostly on 2D stuff here on Fine Art because, well, we’re a 2D medium, I’m always happy to show off the work of animators, VFX artists, 3D artists, basically anyone who works in video games and makes cool art stuff!